The “Restoration and Conservation of the Cultural Heritage and Modernisation of the Related Infrastructure at the Dragomirna Monastery, Suceava co., SMIS code 5565, Romania” project was selected within the Regional Operational Program 2007-2013, “Durable restoration and valorization of the cultural heritage, the creation and upgrading of related infrastructures” and co-funded by the European Union through the European Regional Development Fund. The project had 13 objectives, from which, objective no.3, the “The restoration of the Mural painting” was coordinated by the conservation specialist Carmen Cecilia Solomonea and has involved the participation of over 50 people, from experienced restorers to BA MA students, over the programme period. Each participant had accomplished operations in line with their degree of training and experience, as the complex interventions covered all technical problems. The work was carried out throughout 15 months (10.11.2010-15.02.2012). The Church of the Descent of the Holy Spirit is part of the Dragomirna Monastery compound. It was built in 1609 and decorated by the Moldavian metropolitan bishop Anastasie Crimca and chancellor Luca Stroici. This is a unique monument, through its svelte silhouette and the influences of the 17th century European art. 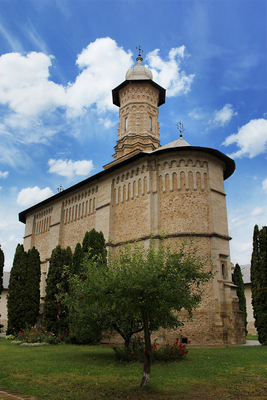 This church ends the series of 16th century Moldavian churches and opens another era in the religious architecture by exceeding the pattern of the Moldavian medieval style, differentiating itself through the architectural dimensions and shapes. The church of Dragomirna Monastery is the original ecclesiastic edifice of the old Romanian art and has its uniqueness based on the relation between the plan and the elevation, which highlights the verticality (~40m), and particularly the high tower that is fully ornamented on the outside with carved stone elements. 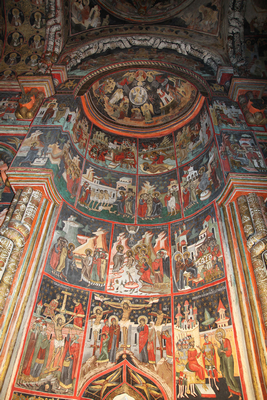 The church preserves mural paintings in the affresco technique as well as areas finalized in the mezzofresco technique, with regions richly gilded by the application of gold foil, including on top of the carved elements, dated to the beginning of the 17th century in the naos, tower and chancel. These painted and gilded profiled stone elements are not present in any other church in the northern part of Moldavia. All carved and profiled elements in the ornamentation of the naos and chancel are covered with a thin limewash preparatory layer, on top of which vegetal, floral motifs and also birds are painted, in strong hues of red, blue, green, black and gold, which complete the complex iconographic program of the mural painting (900 sq m achieved before 1629). For the areas painted in blue, painters used the very qualitative enamel blue pigment which consequently shows a very good state of conservation, with an intensive hue, and on certain areas it is mixed to a small amount of azurite. The state of decay of the affresco painting, the presence of 19th century repairing and overpainting required the undertaking of urgent restoration interventions. A series of decays took place throughout time, when defects at the tower windows and the church roof favoured the infiltration of humidity in the masonry and the mural painting. The paint layer was very sensitive, especially earth colours and cinnabar red pigment. A technical particularity was the copper green pigment which was applied in a thick layer by the painters, in the a secco technique, and which showed a serious powdering condition. The considerable thickness of the paint layer in the Church of Dragomirna was one of the major restoration problems in terms of cleaning and consolidation of pigments. During the 18th – 20th centuries, various interventions were carried out at the base of the walls, consisting in overpainting in weak tempera and oil technique, covering the original painting on the registers at the base of the church walls. Before the restoration works, the quality, chromatic and compositional amplitude of the mural painting could not be noticed as the paint layer was also affected by repairing works with plaster, cement and limewash which caused abrasions, lacunae, scratches. The human factor also affected in time the lowermost parts of the walls leaving incised traces in the painting: names, signs, texts, data, some of which have historical-documentary value. IV. – interventions and treatments on the painting of the chancel and the lower parts of the naos, the aesthetic presentation of the lacunae; interventions for the restoration of the areas with 19th century a secco tempera painting decorating the bases of the pillars of the western wall. The complex mural painting conservation pointed out the spectacular original aspect of the painting restored for the first time after 400 years since its creation. “The result of the interventions is spectacular, and the church can be admired by visitors in its original form designed at the beginning of the 17th century, time when it was an absolute architectural novelty having a sumptuous painting neither seen in preceding nor in succeeding monuments” said Carmen Solomonea, Lead Specialist of Dragomirna Church restoration project. During the Vienna ceremony, on 5th of May, the project was announced as the winner of the Europa Nostra Awards Public Choice Award 2014. More than 10,000 persons - double the amount of the previous year, voted for their preferred projects from amongst the 27 laureates. They voted for their three favourites, of which only one could be from their home country. “The restoration of this monument was not an easy task. The Jury of the Awards praised this project's high-level of professionalism and very sophisticated conservation. The restorers used traditional, natural materials and have done an outstanding job... This remarkable artistic work consists of 900 square meters of frescoes that were returned to their original splendour.” said Denis de Kergorlay, Executive President of Europa Nostra.